Der Artikel Allan Pettersson (1911-1980): Sämtliche Symphonien wurde in den Warenkorb gelegt. 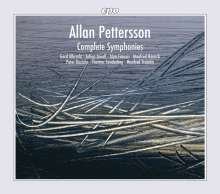 Our highly acclaimed complete edition of Allan Pettersson’s symphonies is now itself complete. In response to the great demand, we are immediately offering this collection in a boxed set. »A magnificent interpretive feat!« This is how FonoForum characterized the edition, and we are happy that we demonstrated the necessary persistence, for over thirteen years and not always under simple circumstances, to reach our goal of a complete edition. And the result proves that we were right. All the symphonies are performed spectacularly by various orchestras, interpreters, and conductors in Allan Pettersson’s unusual and uncompromising orchestral language.